It’s not often that a game like BioShock comes around. And odd thing to say, seeing that it “came around” some years ago. Right now, the gaming world is busy playing through and sizing up the long-anticipated sequel, BioShock 2. Anyone who’s read my two separate impressions of the game knows that, despite all my prior misgivings, I’m having a blast with it. Playing BioShock 2 has made me realize what an influential game the first BioShock was. BioShock 2 doesn’t feel as fresh as the first game did, and here’s why: not only have I seen these gameplay mechanics and storytelling conventions in BioShock 1, but I’ve seen them in countless games since. I thought it before, and I’m almost sure of it now: BioShock may, in fact, be the Ocarina of Time of this generation. Quite a bold statement, you say? Well, here’s another one for you: in this console generation, videogames have finally come unto their own as a legitimate and unique form of storytelling, and BioShock was one of the main proponents of this movement. BioShock was one of the first games to effectively tell a deep, involving, and well-written story entirely devoid of non-interactive cutscenes. You’re never, ever taken out of the gameplay in BioShock – you’re in control the entire time. 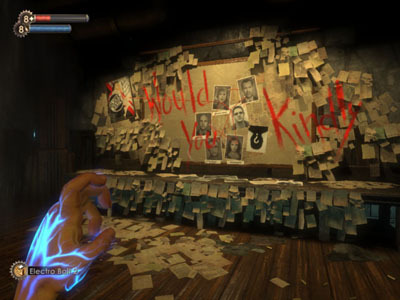 The plot is developed through dialog spoken during gameplay, as well as numerous “audio journals” scattered throughout the world. Even during the game’s most pivotal moments – for example, the fated meeting with Andrew Ryan himself – you never left the world of the game in favor of a cinema. As a result, BioShock was a very unique, immersive, and seamlessly story-driven experience. It was proof that games could tell stories – not movie scenes interspersed throughout gameplay segments, but games themselves. The number of games that have adopted a similar or identical model of storytelling are numerous and obvious. 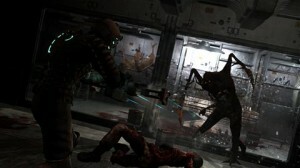 Dead Space, for example, is almost identical in its storytelling: almost no cutscenes are utilized, all dialog is spoken in-game, and dozens of audio/video logs develop the game’s mysterious backstory. The seamlessness and consistency that comes with such a model allows developers to craft a more immersive, poignant atmosphere – can you imagine if Dead Space utilized traditional cutscenes to tell its story? Much like BioShock, Dead Space thrives on its constant, unsettling atmosphere – and being broken from such an atmosphere for the sake of watching a movie would cause the game as a whole to lose its frightening effectiveness. It’s not only Dead Space, of course. Batman: Arkham Asylum, Uncharted, Mass Effect 2, and perhaps even Modern Warfare can all be considered part of BioShock’s legacy in some way. In Arkham Asylum, how dull would it have been if we only ever heard Mark Hamill’s rendition of The Joker when he appeared in cutscenes? Listening to his jeering voice over the asylum’s intercoms was one of the most awesome things about that game. There’s nothing wrong with the traditional cutscene, of course. We’ve been watching them for years, and there’s no reason to entirely do away with them now. Games like Uncharted 2 show that there’s still a place for them in the current gaming landscape, but they are to be used sparingly. 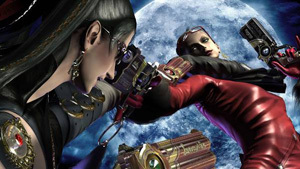 Take Bayonetta, as a bad example – well-done as the cutscenes were, many of them felt entirely out-of-place in this day and age. Why, exactly, do I need to watch a movie scene of Bayonetta and Jeanne dueling? Why can’t I just fight her myself? In the game’s defense, you are indeed given the pleasure of fighting her yourself – but only after sitting through a lengthy and entirely superfluous cutscene. Videogames are the art of interactivity, and to create an artful interactive experience, it’s crucial to achieve a certain level of immersion. Gameplay segments should never feel like obligatory hoop-jumps that connect non-interactive plot points. Rather, the player should feel that with every passing moment that they play, the story is advancing. The player should feel, quite literally, like they’re playing through a story – not as if they’re advancing through a level in order to get to the story. The reason BioShock was and is such an amazing experience is because it’s not something that can be fully replicated through any other medium. The same story told through film wouldn’t even be comparable. It thrives on its atmosphere, and atmosphere in a videogame thrives on interactivity. Not every game needs to be BioShock, and not every game needs to tell its story through audio logs; however, games do need to remember that it’s not what a gamer sees, but what a gamer does that defines an experience. This entry was posted on Monday, February 15th, 2010 at 1:57 am	and is filed under BioShock 2 Week. You can follow any responses to this entry through the RSS 2.0 feed. You can leave a response, or trackback from your own site. Hmm. Well, if you’re looking for a pure survival/horror experience, Dead Space is the way to go. But BioShock is the better game overall, and it does have its share of scares, as well as a masterfully unsettling atmosphere. If I had to choose one or the other, I’d go with BioShock – but both are fantastic and well worth playing.